12 month manufacturer warranty on all accessories. 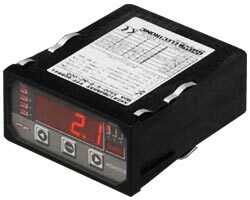 The digital display units in the series HDA 5500 are micro processor controlled display and monitoring units designed for control panel mounting. The Digga electronic display gauge kit displays the differential pressure or usable hydraulic pressure. This pressure displayed on the digital screen allows the user to cross reference the displayed pressure with the torque chart supplied, to determine the theoretical torque generated by the planetary drive unit. Note: This kit can only operate on a supply voltage of 12 -32 V DC. For a detailed description, please click here.